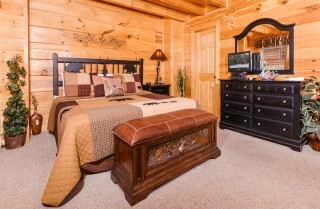 Oh Yea, this is the Pigeon Forge cabin you’ve been looking for! With 2 bedrooms and 2 bathrooms, Oh Yea will comfortably sleep 8 guests, making it an ideal choice for family get-togethers and small group getaways. 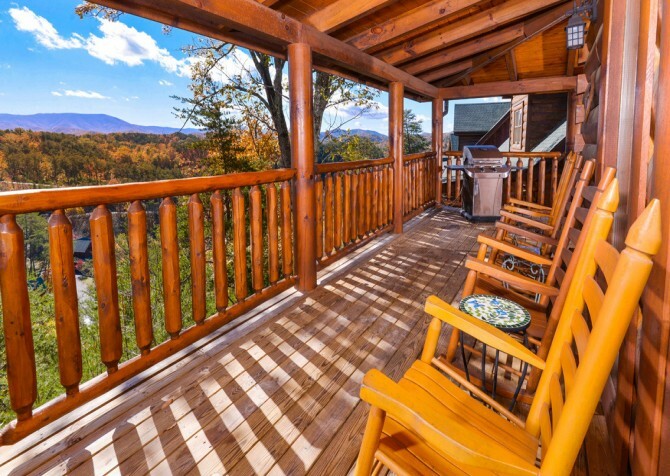 Enjoy views of the Smokies and the tree-studded slopes from this cabin’s covered wraparound porch. 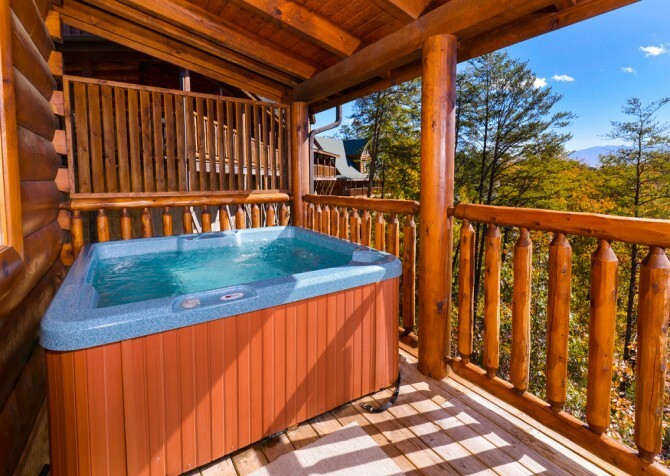 Soak up these sights from the rocking chairs or outdoor hot tub provided by this cabin, and you can enjoy all of them with your furry best friend at your side. 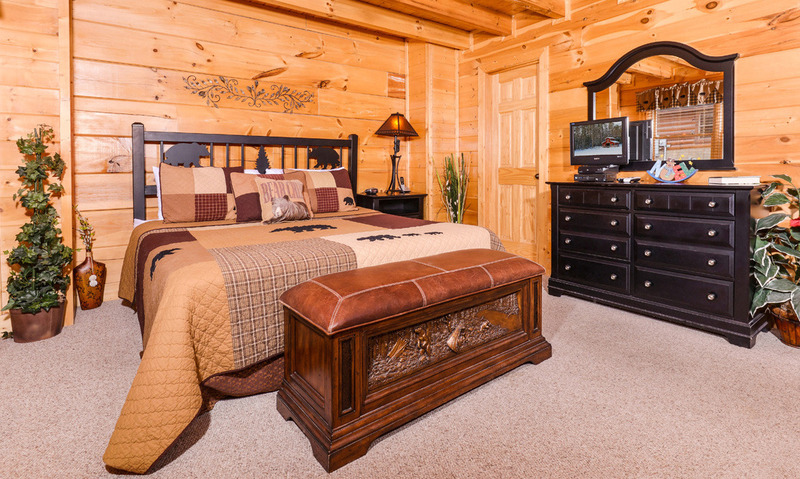 That’s right—Oh Yea is pet-friendly, making it your Pigeon Forge destination for the entire family! 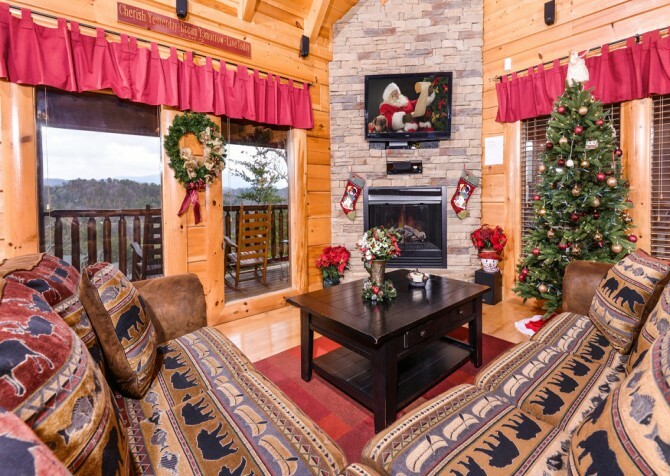 Along with its views and outdoor amenities, Oh Yea provides a cozy interior with plenty of space and splashes of Smoky Mountain décor. 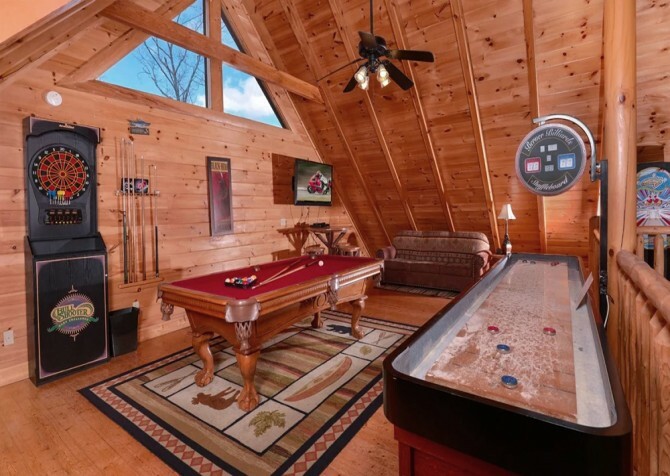 And its long list of modern indoor amenities includes a game-loaded rec room, a big screen TV complete with a DVD player, an indoor jetted tub, and much more! Less than 5 miles from downtown Pigeon Forge, Oh Yea provides plenty of options for fun at the cabin or downtown attractions just down the road. 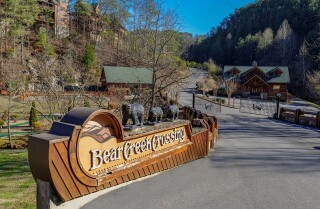 You’ll also enjoy pool access as part of the Bear Creek Crossing Resort. For a cabin your entire family will love, check out Oh Yea in Pigeon Forge! One of the perks of staying in a Pigeon Forge cabin is access to large gathering spaces like Oh Yea’s living room. 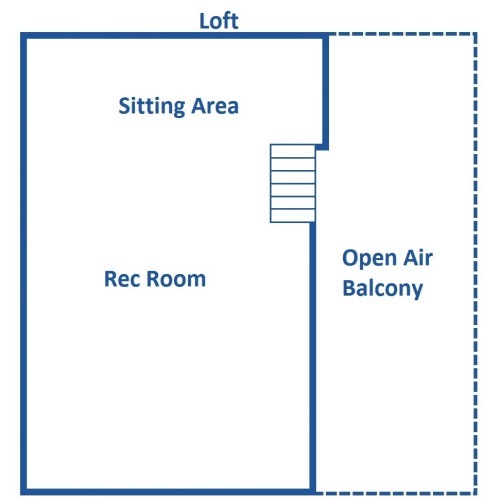 Fit your entire family or small group in this space, which offers a large, cozy sectional, an open-concept layout, and high ceilings. 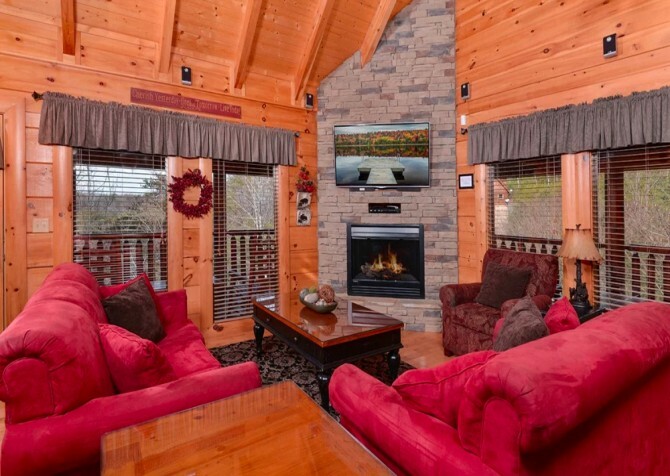 Mounted above the stacked stone (electric) fireplace is a big screen TV with a DVD player. Use this modern amenity for family movie nights in the cabin with your four-legged friends by your side. 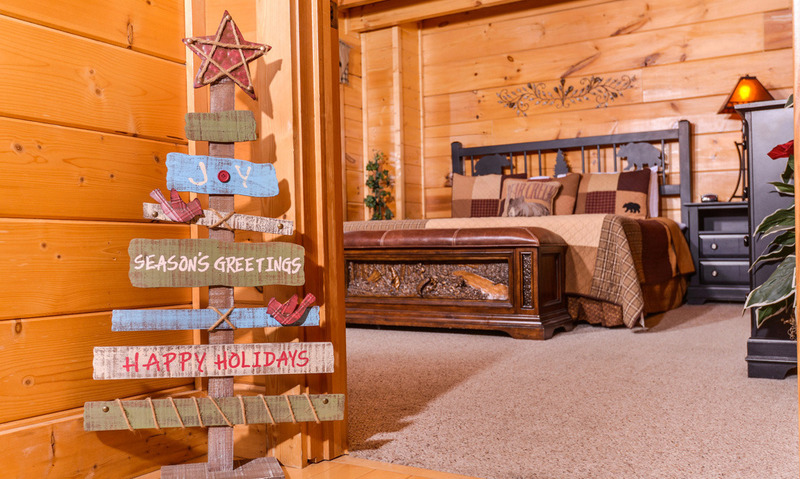 You’ll find this much cozier than a downtown theater since you can save money by fixing your own snacks and stay warm and cozy in your sweats or even PJs if you’re planning some late-night fun. 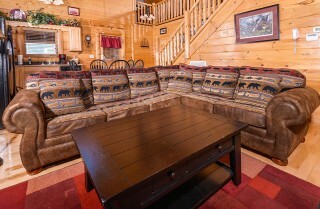 Oh Yea’s living room also offers a large coffee table that you can use for snacks, drinks, board games, or cards. 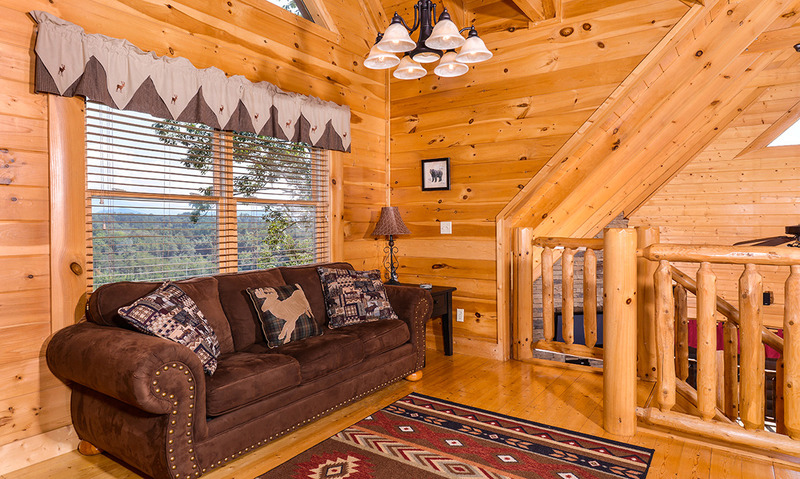 And with large windows, you’ll enjoy natural sunlight throughout the day during your family’s Pigeon Forge vacation. 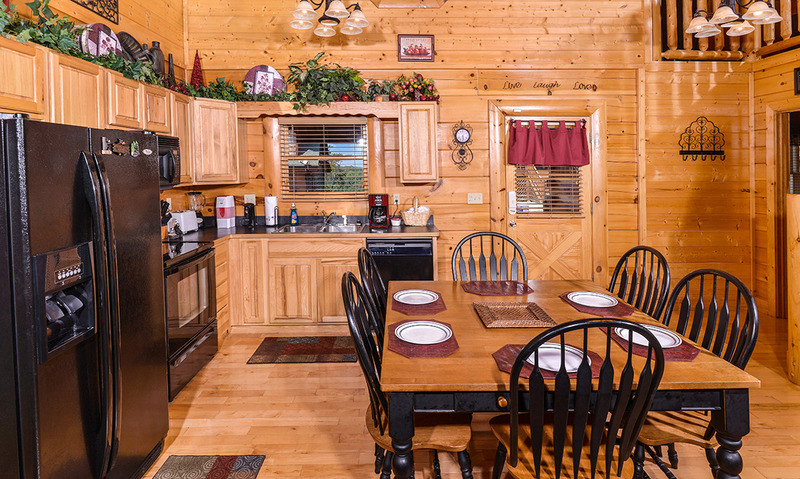 No matter what size group you’re bringing to the Smokies, you’ll love having a full-size kitchen like the one found in Oh Yea! This L-shaped kitchen is open to the main floor of the cabin and features all the necessary equipment for homemade meals throughout your stay. Use the electric stove for omelets in the morning, or toast some English muffins in the provided toaster. 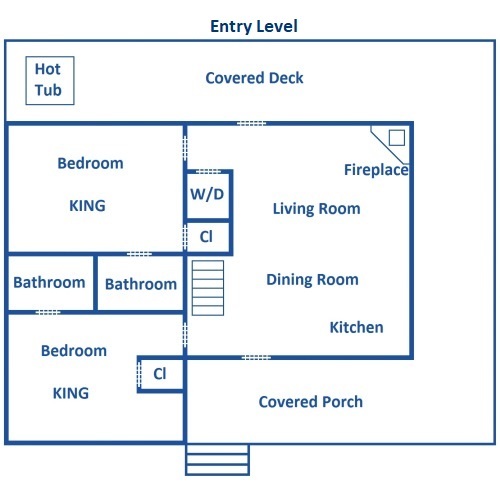 Use the fridge to store your drinks and leftovers from downtown restaurants, and the over-the-range microwave is convenient for quick and easy meals. 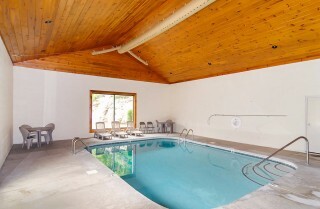 You’ll also have access to an oven, dishwasher, coffeemaker, and blender. All you need to remember is to stop by the grocery store or the nearby Gatlinburg Farmers Mraket on your way to the cabin! After taking the time to prepare your homemade meals, enjoy them around the table in the dining room provided by Oh Yea. With room for 6 guests, you’ll almost fit your entire 8-person group in this cozy dining space. 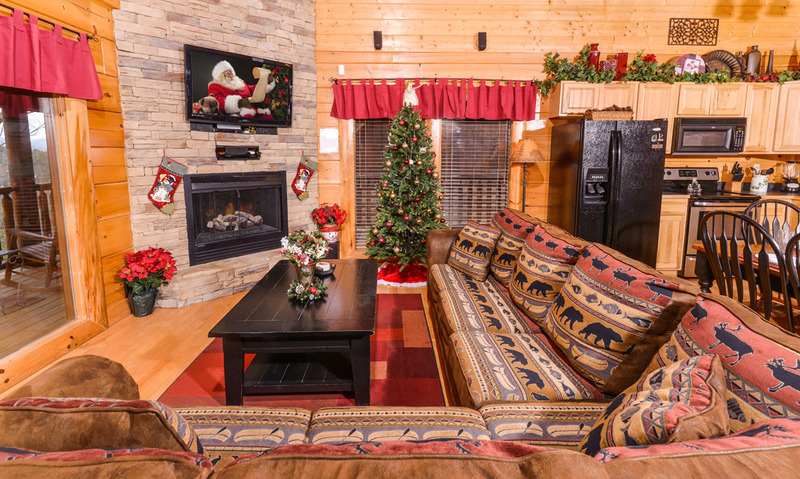 The black-and-tan table has a modern appeal that your guests will love, and if you need more space, simply spread out to the cozy couches in the living room thanks to this cabin’s open-concept layout. Along with a private space to enjoy your meals, the Oh Yea dining table provides a place to play board games or cards in the evenings, make gingerbread houses during the holidays, and display your favorite snacks on game-day afternoons. Attractions like Dolly Parton’s famous theme park Dollywood aren’t far from Oh Yea, but you don’t have to leave this Pigeon Forge cabin to have a great time. If you head upstairs to the fully loaded game room, you’ll find plenty of ways to have fun on a rainy day or a lazy afternoon. 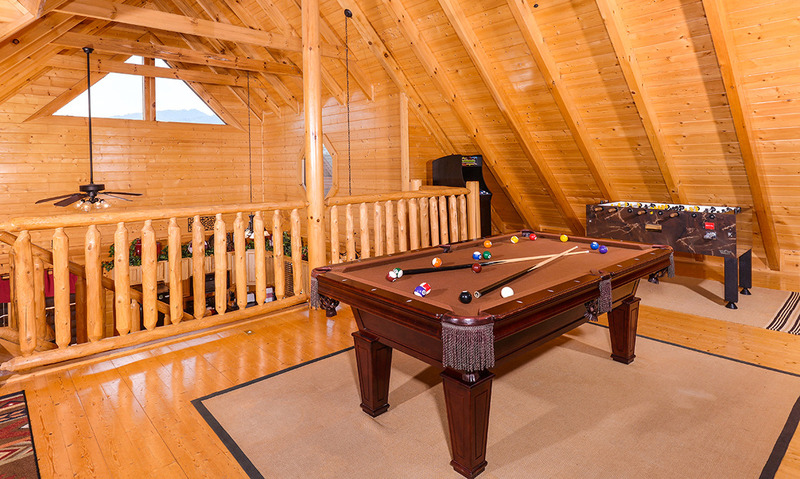 Play a game of 8-ball on the pool table or plan an air hockey tournament with the kids. Oh Yea also has a dart board, foosball table, and arcade games, adding tons of options that will appeal to every age. Other amenities inside the Oh Yea rec room include a flatscreen TV mounted in the corner, a small table that’s perfect for checkers or cards, a CD player, and comfortable seating. 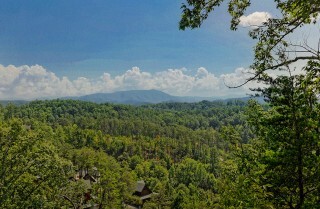 Oh yea—you’ll also love the large windows with Smoky Mountain views! 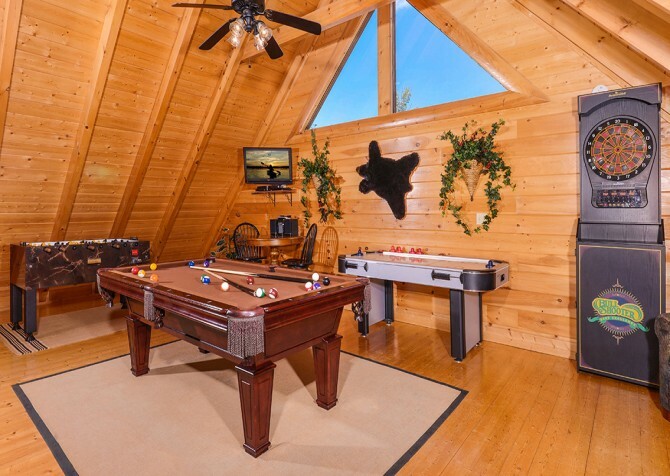 Oh Yea has truly thought of everything with this large, inviting, game-filled space! 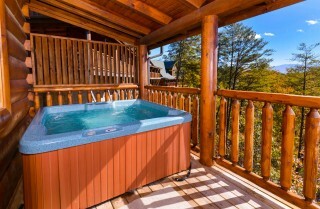 Oh Yea is an ideal size for single family vacations, couples vacationing together, or any other combination of 8 guests. Inside this spacious cabin, you’ll enjoy 2 bedrooms and 2 baths, both of which are located on the main floor. Both bedrooms feature a king-size bed, traditional wooden furnishings, warm décor in the style of the Smokies, and flatscreen TVs. 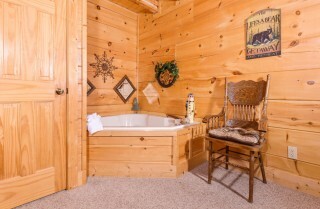 And in the master suite, enjoy a bonus amenity with your indoor jetted tub! This is the perfect place to soak your stress away after a busy work week or a hike in the Smoky Mountains with your furry best friend at your side. 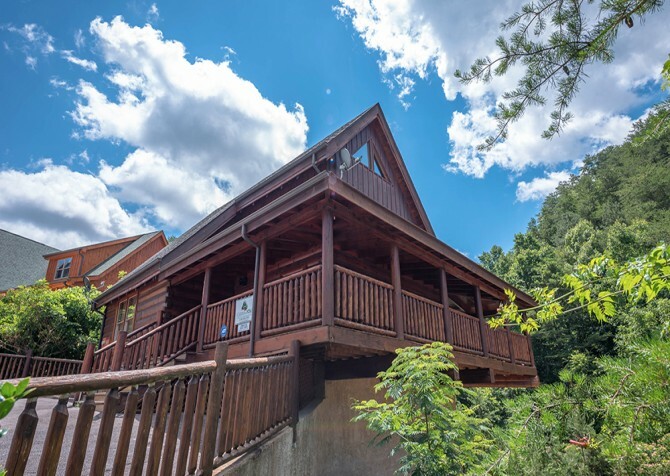 Be sure to check the Great Smoky Mountains National Park’s website for more information about pet-friendly hikes during your stay at Oh Yea. When you’re in Pigeon Forge, you can enjoy beautiful views from the sky with a helicopter tour or zipline adventure, or you can simply relax on your covered back porch at Oh Yea! The covered wraparound porch at Oh Yea provides a cozy place to experience the beauty of the Smokies with a mug of fresh-brewed coffee or a glass of sweet iced tea in your hand. Kick back on one of many rocking chairs provided by Oh Yea, or change into your bathing suit and enjoy a relaxing dip in your outdoor hot tub. Oh Yea also provides a private sauna to help you maximize your R&R while you’re in the Smokies. 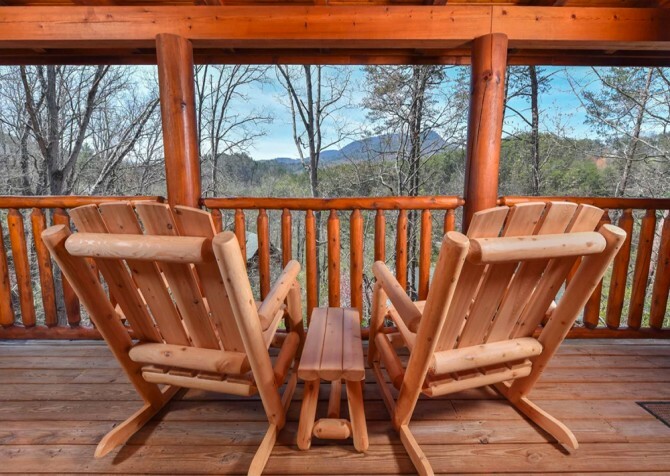 And for your convenience, enjoy a gas grill located on the deck. 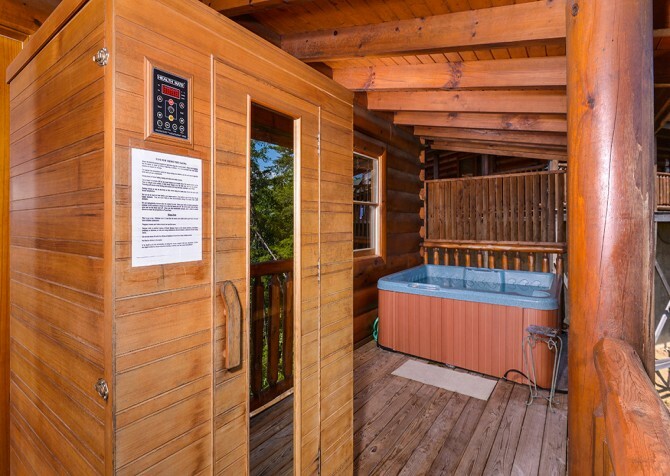 If you’re in the mood for juicy steaks or want to celebrate Memorial Day with a traditional family cookout, you can make that happen with Oh Yea’s outdoor amenities and supplies! 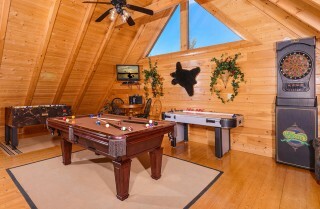 The game tables in the rec room are only the beginning of the entertaining amenities you’ll enjoy when you book your stay at Oh Yea. As part of the Bear Creek Crossing Resort, this cabin also supplies access to an indoor and outdoor pool. Additional amenities provided by Oh Yea include a VCR and premium movie channels on every TV, a cordless phone in the bedrooms and upstairs loft, access to a washer and dryer, access to a hair dryer, a paved (though steep) driveway with room for 3 cars, and high-speed wireless throughout your stay. 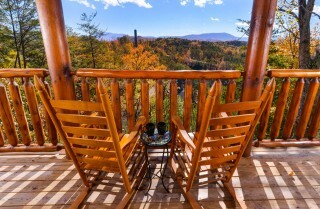 With all these extras, Oh Yea is sure to become your luxurious home away from home in the Smokies! A Cabins for YOU partner, this Pigeon Forge theater offers family-friendly variety shows with live music, comedy, and dancing. Looking for a dinner show with axe-swinging, log-rolling, high energy fun? Paula Deen's Lumberjack Adventure has it all! Who said you have to be a kid to enjoy a game of laser tag or a ride around the go-kart track? This rec center also features mini golf and a large arcade. 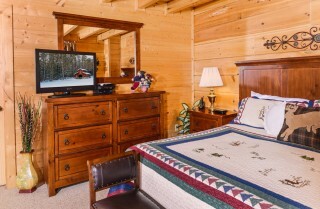 *Cabins for YOU partners offer discounts to all our guests. Ask a reservation specialist about the specific discounts offered by these and other local attractions. 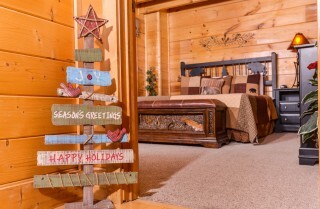 "This was our first time renting a cabin, but it won’t be our last! The experience we had with cabins for you was amazing from start to finish! 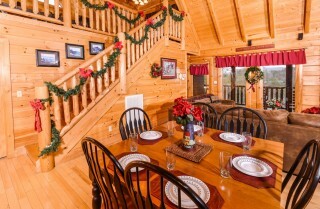 When we walked into the doors of our cabin everything was so clean and inviting. 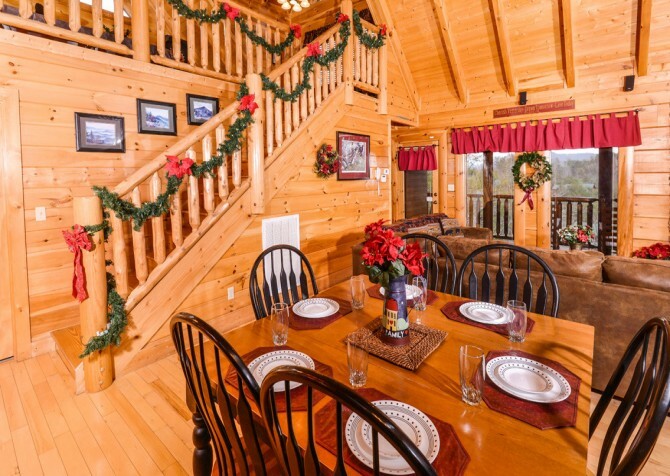 It was…"
"This was our first time renting a cabin, but it won’t be our last! The experience we had with cabins for you was amazing from start to finish! 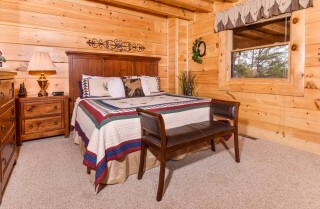 When we walked into the doors of our cabin everything was so clean and inviting. It was truly a little oasis. We got locked out of our cabin on the first night (our fault) at around 11pm. 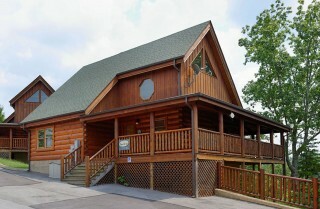 Everyone at CFY was so nice and quickly came over and got us back in to our cabin. We can’t wait to return! We’ve been ready to go back since we walked out of the door on our departing day." We are so pleased to hear you had an amazing time! 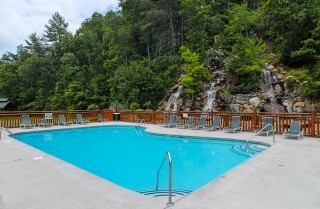 Thank you so much for this raving review, we can not wait to have you stay with us again!